In which I describe how Twitter Lists could supply us all with the power of context. 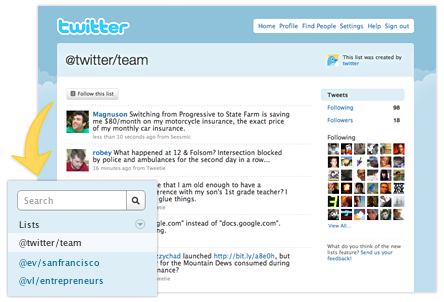 Twitter have just announced that you will be able to organise individual Twitterers into Twitter Lists. This makes official the kind of organisation users have be doing with client applications such as TweetDeck – the kind of application anyone who follows more than 500 people has been using in recent months. Instead of seeing every update from all the people you follow, you can view just the tweets from specific groups of people. At the moment Twitter is selling this new feature as a method of finding interesting people to follow. I might want to curate a List of people who write about post-production for example. By default, user-created Lists will be public. Once this List is known, and favoured by many people subscribing to it (as opposed to those ‘other post-production Lists’), I’ll have an incentive to keep it fresh, so the people that follow the List will have a continually refreshed list of ‘experts in a field’/’entertainers on a topic’/’philosophers of a specific school’/’fans of a given TV show’/’alumni of a school’ etc. The first side effect of Lists will be that people who follow a couple of hundred others can now follow many more – knowing that these ‘check out their updates every once in a while’ follows can be relegated to a list that doesn’t clutter up the main feed. This will mean well-followed people/organisations will become even-more-followed people/organisations. But being followed by many people more who don’t read your updates very often might not improve your ‘Twitter Authority’ score. However, once people can limit searches to these Twitter Lists, the results they get back will probably be much more useful. Firstly, they’ll be able to search the text of the tweets of people in a given list. Then they could have the option for that search to include the content found at the site linked to on List members’ profile pages. After that the search could include the content linked to in the tweets, such as TwitPic pictures, Song.ly lyrics, text/images/videos from web links. If Twitter then saw which link was clicked from the list of results, they’d be able to create a ‘PeopleRank’ algorithm that could stand a very good comparison to Google’s PageRank algorithm. In this case the person/organisation which supplies the best information on a subject will have their content moved further up the list of search results. A new measure of Twitter authority. If there were default lists like these, Twitter would become very powerful in many ways. If users got accustomed to switching between these standard Lists of Twitterers they wanted to see the updates of, Twitter would be able to infer the new context they are changing to. If someone wanted to be entertained, they’d view List 7. If someone wanted to do some background research on their field of work, they’d view Lists 5 and 6. If they were in a frivolous mood, they might view Lists 1 and 2. Once Twitter knows your context, they can associate your context with the tweets you write, the information you give out and the searches you do. In this way context 2 would allow Twitter to act like Facebook-Lite. Other contexts could implement versions of other social network models: e.g. context 5=Linked-In, context 7=MySpace. Also if you defined the mode you were in, then the searches you do could supply better tuned content. It also means the day you spend searching for content associated with work would skew the searches you do when looking something up for a family member. If users maintained these lists then different groups could get different versions of other information, such as location. When I’m in Family and Friends mode at the weekend, only they get my location information – other lists might get a ‘blurred’ location such as ‘London’. When I’m away at a conference, people in my Colleagues and Industry Contacts Lists would be able to find me on the exhibit floor (or at a specific local bar), while Family and Friends need only know that I’m away in ‘Barcelona’. Who else would like to know what context we are in? How about advertisers? Imagine if we’d never see an irrelevant advert again. I don’t want to see or hear ads for movies when I’m concentrating on work. When I’m catching up with friends, I won’t be interested in being served adverts associated with my job. I think advertisers would get much better responses if their messages were being presented to people who were in the correct context to receive them. There are some great ideas and speculations here…thanks for your post. You really understand the implications of the new lists.